Before any email gets offered to an agent it's routed through an email flow, just like incoming chats are routed through a chat flow and calls are routed through a call flow. Click on Edit Flow next to the email address that you wish to edit the flow for. Select which queue the email conversations should be delivered to. When an email comes into the selected address and reply is included in the flow, an email is automatically sent back to the requester based on the template that is selected. Auto-reply templates can be created under Settings > Templates. Note that, at this stage, the reply is not added to the conversation in Conversation View. The content action can be used to change what should happen to an email conversation based on what is being said in the email. You can select what happens based on content in the title of the email (subject), the main text of the email (body) or the sender’s email address (from). Select the type of rule that you wish to apply to the content. This can be whether the email contains or does not contain specific words or phrases, whether it is or is not a certain phrase or address, or whether it starts with or ends with something specific. You can also create more than one rule for each content action and decide whether all rules must apply for the email to be directed a specific way, or whether just one or two of the rules (any) will suffice. The content action is not case sensitive. Meaning both Cancel and cancel will be matched. Set your opening hours and choose what happens to emails when you are either open or closed. Perhaps you want to direct your emails to a different queue or send out an auto-reply (explaining that you are not in the office) when you are closed. This will end, or close, the conversation. 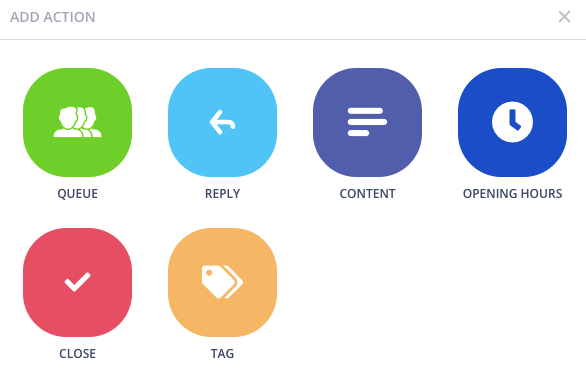 The tag action will automatically tag any email that comes into that specific email flow with the tags that you select. For example, for an email that is assigned/dedicated to the billing department you may wish to add an auto-tag of billing for any emails that come to that email address. 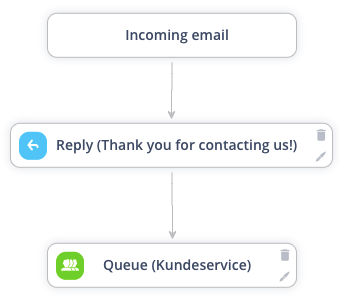 An example of a basic email flow which automatically sends a reply and then directs the email to the Kundeservice queue. An example email flow which takes opening hours into account, uses reply and uses tagging. One final thing to note is that if you wish to add a new action to an email flow, then you must delete any action that will come after it in the flow before you can add it.